In New York for a meeting with Ari Messer, publicity guy for Stone Bridge Press. At least, that’s the official excuse. Unofficially, I am here to drop in on the New York Met, whose exhibition on the Art of the Samurai features a whole bunch of old friends. 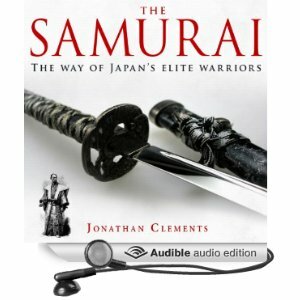 Well, I am not sure we would have been friends in real life, but after spending many months writing the Brief History of the Samurai, I feel I already know them. A suit of bright crimson armour with golden horns dominates the entranceway, and belongs to the Ii clan, whose legendarily “accidental” charge against orders kicked off the regime-changing Battle of Sekigahara. There are sword-guards and daggers, signalling-fans and arrows, but amidst it all is Exhibit 96. Exhibit 96 is a sword. Others on show are deemed more expensive. There are older and newer blades, many with airtight provenances that they were held by this general or that general, conferred as gifts by the great movers and shakers of history. But this one has mottled blotches of dark mist on the blade, as if the metal is alive but somehow rotting, clouds boiling on the steel as if it is not a sword but a silver abyss. Etched into the tang with characteristically choppy handwriting are two simple characters: Mura Masa. It isn’t the first time I have seen a Muramasa. I do have a habit of hunting them down whenever I get a chance. As a child, I found one in London, sitting on a rack at the Toshiba Gallery at the V&A. In 2003, I found another, in pride of place in a Tokyo Museum. This one at the Met comes with a sign that readily acknowledged the badly-kept secrets of the Muramasa blades: that in the 18th and 19th century they were believed to carry a curse against the family of the Shogun. Muramasa swords, it was said, were cursed. In 18th century kabuki theatre, acquisition of a Muramasa did the same for one’s well-being as building a hotel on an Indian burial ground. The swords were indubitable works of art, but brought such awful woes upon their owners that people did everything they could to get rid of them. Many were destroyed. In the late 19th century, as the tide turned against the Shogun, Muramasa swords acquired an unexpected, rebellious frisson. Suddenly, they were the thing that all the coolest samurai wanted to carry, and as a result, there were many fakes. Exhibit 96, however, is the genuine article.